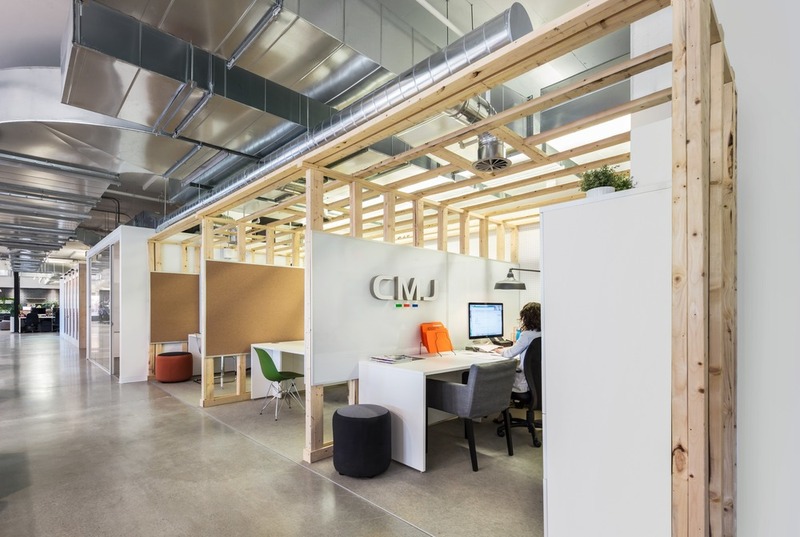 Last September, audiovisual production company Attraction moved into its new workspace and for the 300 or so employees, the change was drastic. 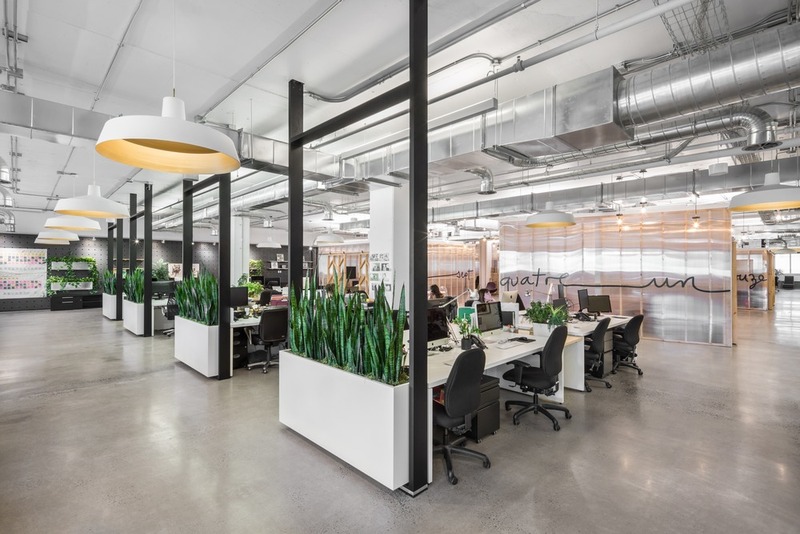 Previously divided by activity sectors on two different floors, each with their own corporate identity and culture, the company left its closed offices behind to join together in a shared single floor space of 53,000 sq ft. 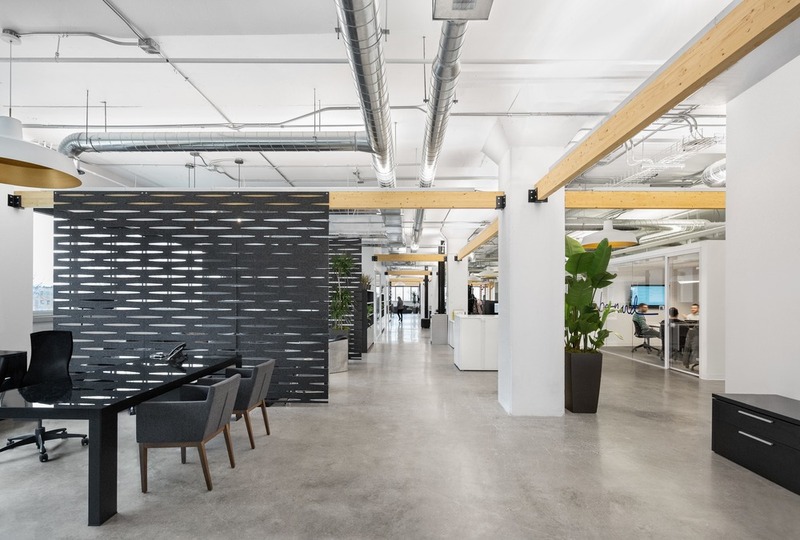 Located in a classic Mile-End industrial building in Montreal, Canada, the location has the advantage of having access to daylight on three sides as well as having a polished concrete floor with a beautiful effect. The constraints were rows of industrial ducts beneath the high ceilings along with a very tight 13-week schedule. After observing the work habits of the future users and embracing the multimedia creatives’ desire not to be limited to a singular style, designers from LumiGroup and Imperatori Design “settled on a balance between some structure and what might first appear to be slightly chaotic, which was ultimately very intentional, taking into consideration the various functions”. 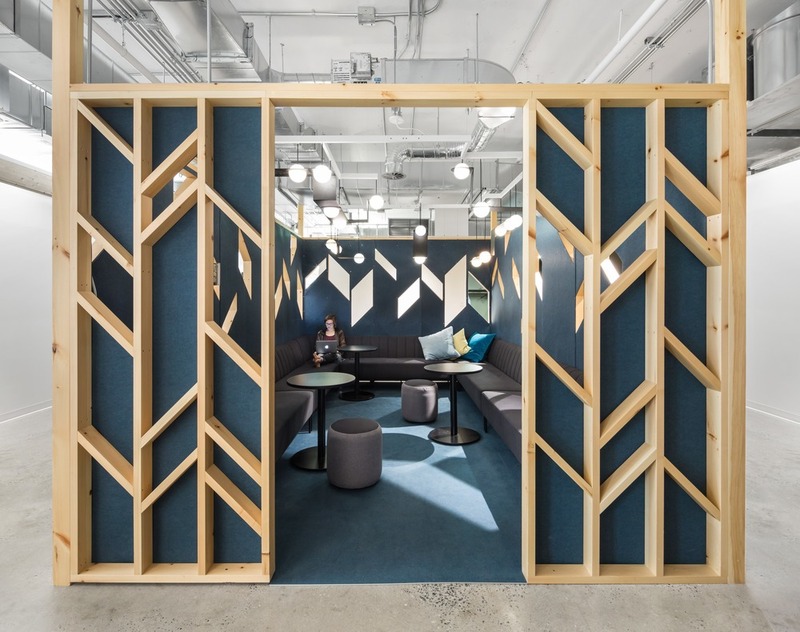 The U-shaped design studios and corporate functions benefit from natural light while the computer editing section occupies the windowless wall. Reflecting the “unified environment” objectives, the wide circulation areas enhance the fluidity of exchanges between departments. 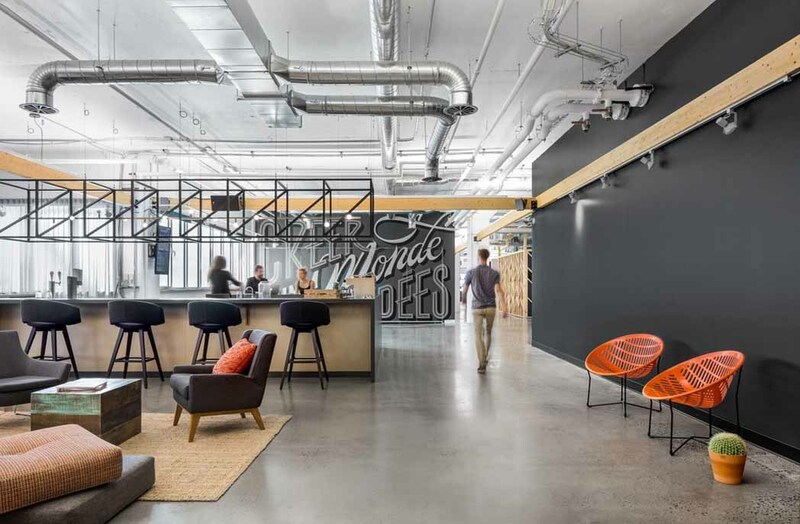 An area dedicated to the well-being of employees has a place of choice, under the east-facing windows. 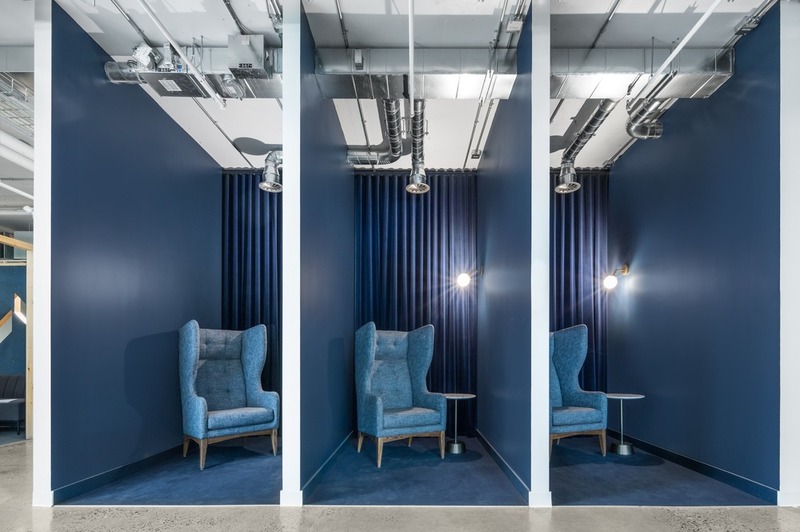 The entrance opens onto a large lounge, adjacent to the room that welcomes both collaborators and customers as well as nomads wishing to sit, work, talk with a colleague or simply re-energise. 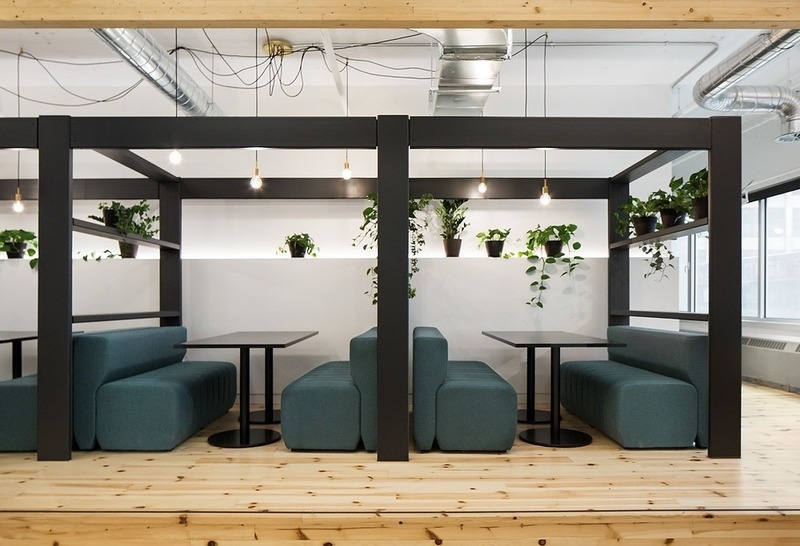 A play of proportions is established between the concrete 12 ft high ceiling and a grid of wooden beams fixed between the columns at 8 ft 6 inches, which has the dual function of bringing warmth to the space and camouflaging the indirect LED light fixtures. The lighting is therefore discreet and ensures a subtle but effective luminosity. The reception and the room enjoy a friendly ambience. “Employees, directors, customers, everyone loves it” shares a production coordinator. 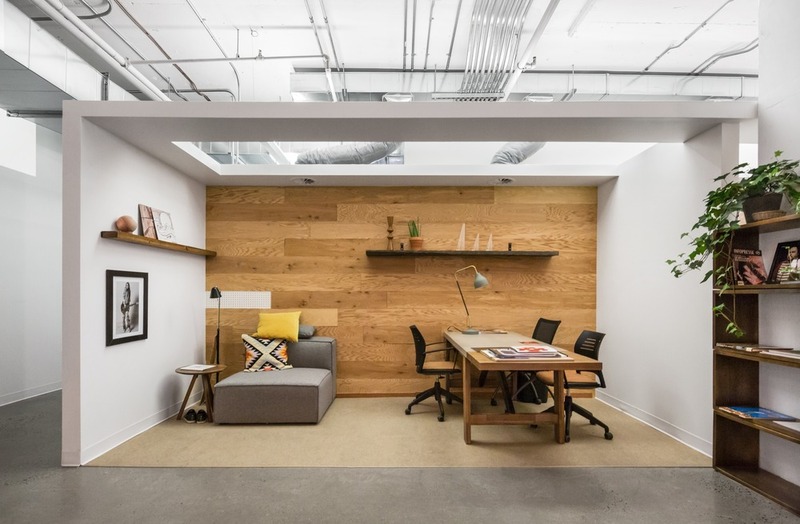 In an eco-responsible spirit, and in order to keep the costs within a precise budget, the furniture is largely (75 percent) recovered from the old offices. With a few exceptions, the workstations, ergonomic chairs, armchairs, etc. come from local Quebec manufacturers, a priority encouraged by Attraction’s top leaders. Among the recovered objects, in the cubicle of the corporate department, we notice the Laurent suspensions, collectors’ items made by the craftsmen of Lambert et Fils.